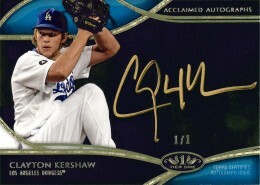 Topps is now the exclusive home for Clayton Kershaw autograph cards. The card maker has reached an agreement with the reigning National League Cy Young winner that includes Topps donating $100 for every strikeout Kershaw records in 2014. Proceeds go to support Kershaw's Challenge, a non-profit dedicated to helping kids in Los Angeles, Dallas and Zambia. In addition to having autographs in 2014 products, Kershaw will also appear on the packaging for 2014 Topps Series 2 Baseball. In March, Topps announced a new exclusive agreement with Bryce Harper of the Washington Nationals.